Switzerland is incredibly popular with its ski resorts. And this is not surprising, as there are located one of the best winter resorts worldwide. But in addition to active recreation in the mountains, Switzerland can offer more relaxing holiday. If you like it, then we would like to introduce you The Thermalhotels & Walliser Alpenther, which is located in the center of Leukerbad, surrounded by the Alps of the Canton of Valais. The General Manager Helmut Anzer has kindly agreed to answer questions made up by our Managing Director Vasily Maslov. V.M. : Could you tell a little about location history of the resort? H.A. : Of course! History of the location is really interesting. It has been long thought that the discovery of the mineral springs of Leukerbad and the settlement of its residents go back only to the 13th century. This could however be rebutted with finds from recent times and we know now that Leukerbad was inhabited later than the 2nd century of our era. And there are amazing historical facts. Traces from the Celts into the 4th century before our era are found here. But of course, who else other than the Romans used the thermal springs. 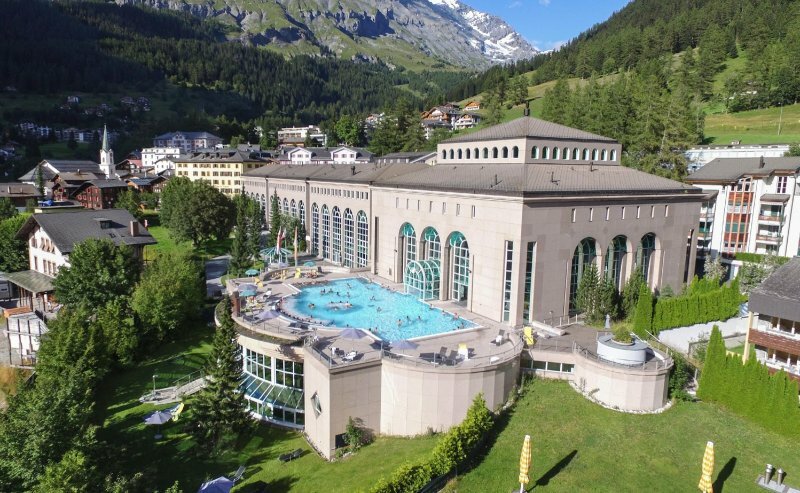 Their commitment to hot springs here is confirmed by findings from the time of Vespasian and Diocletian in Leukerbad. V.M. : This is really interesting. And what can you tell about resort sights? H.A. : Oh, here is beautiful nature, as Thermalhotels & Walliser Alpentherme is surrounded by the impressive 4,000-metre high Valais Alps, at the heart of Leukerbad (1.411m height). And the complex itself consist of three buildings: the Grand Bain, our proud Maison Blanche (built 1645, first stone hotel in the region) as well as the Hotel de France (built in 1845) which was fully renovated in the beginning of 2018. They all have a long and attractive history by the way. Additionaly, we have our own peculiarity – the 135 rooms and suites are spread between the buildings, which are connected by an underground tunnel to the Walliser Alpentherme. V.M. : Wow, impressive! This is unusual and very comfortable. And what about hotel’s history? When your hotel was established? Who was the first owner etc.? H.A. : The history of the founding of this place goes back to the past. In 1315 Leukerbad could be found as a separate municipality in documents and even then one spoke of the hot springs. From 1478 the first inns were built. When, in 1501, the new Valais Prince-Bishop Matthäus Schiner acquired the bathing rights and propagated the place on his travels throughout Europe, things went quicker and quicker. Probably also helped the descriptions of the thermal springs by Paracelsus, Sebastian Münster, John Stumpf or Pitctorius. Anyway, it set the first big tourist flow. Unfortunately, a considerable number of avalanches destroyed the infrastructure in Leukerbad throughout the 16th century. It was rebuilt, the source rights changed hands again and also the oldest hotel in Leukerbad dates from the end of this century. Namely, the "Maison Blanche", then the "White House" and today part of the Thermalhotels & Walliser Alpentherme Leukerbad. V.M. : This is really long history, I guess it makes your resort even more attractive for tourists. Well then, the main reason of our tourists travel to Switzerland is skiing. So, why should they choose a resort where your hotel is located, and as a result your hotel? H.A. : Definitely because of the hot springs. This is Leukerbad’s main strength. You have it 365 days per year. In Leukerbad 3.9 million liters of thermal water up to 51 degrees spew daily in a total of 30 pools. This corresponds to the richest thermal water occurrence of all Europe. Even if we do not have the longest and biggest ski area in Valais, next to the ski facilities we can offer the wellness and spa treatments during the whole year. If you are exhausted of skiing, you can jump into the thermal water, which is rich in minerals and trace elements. In summer more than 200km of hiking trails, mountain biking, Helsana Swiss runnig walking trails, monster scooters, rock climbing, via ferrata, tennis, paragliding as well as Golf. V.M. : Sounds great, it's not only pleasant procedures, but also very useful for health. But if you still want to go skiing? H.A. : If your choice is skiing: at the Rinderhütte a wide range of slopes is starting from blue ones to black ones, from easy to extreme. Everyone will find his/her perfect slope to enjoy the spectacular and unique view of the Rhone valley. There are more possibilities than you might think of: About 50 km slopes, some of them already used during world cups, or a Snowboard Funpark which will stir snowboard lovers blood. The Torrent area is considered to be particularly snow-assured due to its lack of rocky slopes. Thermalhotels is located just about 4 minutes walking distance from Torrent cable cars. V.M. : Now I have a desire to guest at your hotel! And what about services? I mean, how can you describe your accommodation facilities? What special offers/features do you offer in room services? H.A. : The location of the hotel is very convenient, the hotel is located in the middle of the village, both cable cars, shops are in a few walking minutes reachable. Since the hotel has its own spa area, the guests can enjoy it daily from 7 am till 10 pm or just use the underground tunnel to get to the Walliser Alpentherme, which is connected with each hotel buildings as I said before. For family rooms and suites we offer parking and the baths of Walliser Alpentherme free of charge and for clients staying in De France by Thermalhotels 4* Minibar and the baths of Walliser Alpentherme are included. Free shuttle transfer all around Leukerbad is offered for all of our clients. V.M. : By the way, speaking about families, what does the hotel offer for families? - We have a play corner for kids and a rabbit family to spend some time with and to watch them. - Easter and Christmas time, we organize some programs, like egg painting, handmade presents for Christmas, so they can be creative. - Families can enter to the spa area as well to enjoy the water (suggested for 30 minutes with a break of 30 minutes, depends of the age). V.M. : Very good. But what about young people? What does the hotel offer for them? H.A. : Oh, we definitly have something to offer to young people. We have our special event, regulary around 9-10 times per year you can buy your ticket for the “Thermal night all inclusive”. It includes a welcome drink with buffet dinner, use of the swimming pools, Valaisan Sauna Village and the Roman-irish bath during 3 hours for a really favorable price. The thermal nights are structured and decorated according to the theme. I can say it must have! Then, The Bar Grand Bain has diverse Cocktails and Drinks to enjoy in the summer time on our terrace and the staff serves drinks by the hotel swimming pool as well. If you prefer to have a coffee break or lunch, you can enjoy it in the Alpentherme around the outdoor swimming pool. For request we have yoga, personal trainer offers to keep the young ones fit. V.M. : It seems like no one will be bored at your hotel! Also I would like to know does your hotel conduct some concerts of modern singers/bands/performances/workshop etc.? H.A. : Certainly! We have very large and interesting program. - Yearly there is the “Ländlermusik Week-end” in September. 16 different music formations are playing in 17 restaurants, locals. This year the closing party will be organized the the Bar Grand Bain. - The International Literature Festival is placed every year in the Walliser Alpentherme, where over 30 authors bring the world of literature to the Upper Valais and present their works for three days in a dense and high-caliber program at the special reading venues in and around Leukerbad. V.M. : That’s great! Maybe you have some new ideas about events? H.A. : Yes, I was about to tell you about that. We are planning to have more of these kind of events for 2019, just as a music weekend with another kind of music to reach more clients with other interest. Since our seminar rooms can arrange events up to 260 persons, it would be possible indoor or in the Alpentherme/ Tennis place outdoor. V.M. : You have big plans, I hope it will become true. Okay, let’s talking about guarantees. Imagine the situation: tourists came and the weather turned bad (avalanche, blizzard, or conversely, warming, everything started to melt and so on.) What can you offer for tourists as entertainment outdoor or indoor activities? H.A. : Fortunately, this does not happen often, but in this case, we have something to offer our guests. The Walliser Alpentherme with its treatments and facilities (Beauty Institute, the full range of treatments based on local traditions and products, Ayurveda, Chinese Medicine, Fitness) offers a wide list of services just as well to enjoy and relax in the hot spring water or sauna. The Valaisan Sauna Village with its 300 m² was designed with great attention to detail and incorporates a variety of local building material like slate and weathered timber. Explore the village and its range of saunas, and experience the region’s unique charm and traditions. Also Sportarena Leukerbad have as well a lot of option to be active indoor and/or outdoor. (Tennis, Squash, Badminton, Football, Minigolf etc). V.M. : You have all for the perfect holiday. So, I have one last important question. What are the best means of transportation to reach the hotel from main airports and railway stations? H.A. : Everything is very easy. You can reach Leukerbad by car from Geneve, Milan, Zurich and Basel airports. It will take you up to 2-3 hours. If you arrive by train (same time from any), at Leuk train station you have a direct bus up to Leukerbad(about 30 minutes drive). From the bus station in Leukerbad (5 minutes away by foot from the hotel) we can pick up our guests with pleasure with no charge. Additionally, the transfers could be arranged for the guests according to their needs.